Ryan Foizey, a well respected actor in town, has a new start-up theatre group called Theatre Lab and he has chosen a thought-provoking vehicle for his first production, Cormac McCarthy’s “The Sunset Limited.” Directed by Mr. Foizey, two of our best local actors- Zachary Allen Farmer and Robert A. Mitchell- make this play come alive with grit, drive and a remarkable chemistry. True guardian angel or just a religious zealot? That’s the first question that comes to mind after viewing this intense two-person drama. Known only as “Black” and “White,” Black, Robert A. Mitchell’s character, has saved White from committing suicide by throwing himself in front of the speeding Sunset Limited as it roars through town. White claims he looked around before attempting the act and saw no one- asking Black how he got there and how he pulled him from danger. The fact that Black has brought White back to his shabby apartment to recuperate sparks a lively conversation about religion, life and death, and the worth of one’s life. Although anxious to go, White can’t seem to pull himself away from his enigmatic savior. Finally, in a burst of rage, he angrily leaves Black’s apartment with a vow to somehow finish what he started. Zachary Allen Farmer’s work has almost exclusively been with Scott Miller’s New Line Theatre- in other words- in musicals. Not a likely choice from first glance for musicals either, he has proven himself over the years to be an accomplished musical talent in both supporting roles and, in the case of two recent New Line successes, as a leading man in “Two Gentlemen Of Verona” and most recently as drunken beat generation writer Charles Bukowski in “Bukowsical.” His work in “The Sunset Limited” is superlative and could lead to even meatier roles in straight plays and even comedies- although we hope he continues to “wow” us with his work in musicals. Bob Mitchell has been on the St. Louis scene for a long time and even headed up his own company- The NonProphet Theatre Company- until it closed a year or so ago. We know his talent is immense with his great performances over the years but he brings something really special to “The Sunset Limited.” With a wide range of emotions from outbursts of pure joy to intense anguish to the wrung-out powerful final moments, this is a performance that will be a powerful highlight in an already wonderful career. Unfortunately, he informed us after the show that this will be his last St. Louis appearance on stage as he is planning a move to New Orleans. We wish him luck and success there and are thankful that we got one last chance to see him here. 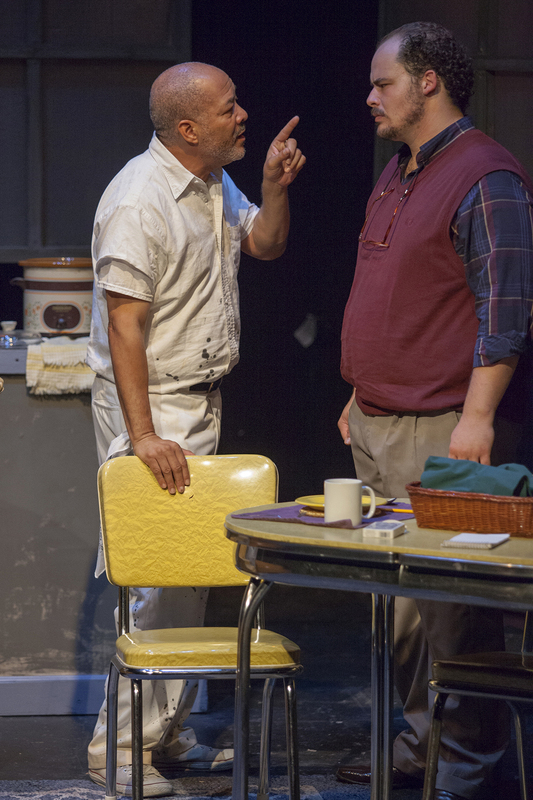 Besides directing “The Sunset Limited” with a masterful hand and eye for detail, Mr. Foizey, along with David Blake, created the realistic set with a strong lighting design provided by Tyler Duenow. Marcy Wiegert brought a comfortable and effective costume design to the professor and the preacher as well. It’s always an iffy proposition to bring a new player into the St. Louis theatre scene but we’re always happy to see someone take that leap of faith. With a positive concept and outlook for Theatre Lab, I believe Ryan Foizey may have found a niche in that scene and we look forward to what he can bring to the stage in the future. He certainly succeeds on a grand scale with his initial effort- thanks to his own vision and the work of the two powerful actors that bring this script to vivid life. 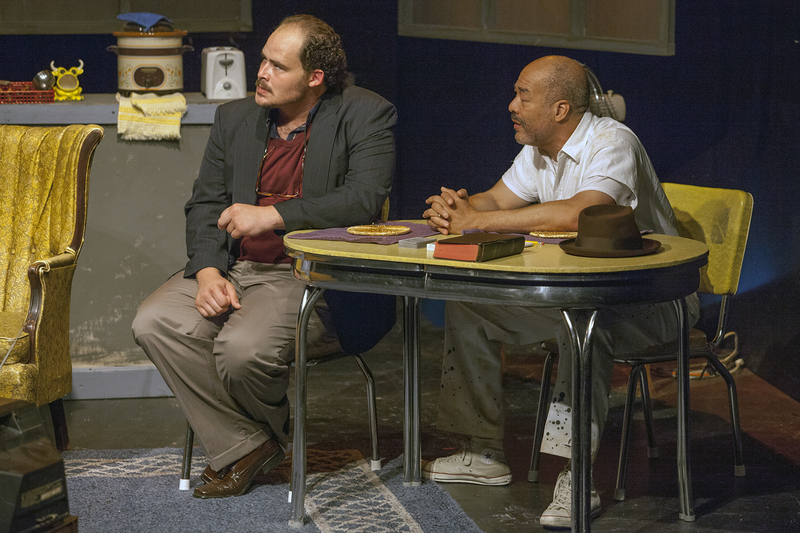 Catch “The Sunset Limited” on stage at the Gaslight Theatre through August 17th. Call 314-599-3309 for tickets or more information. This entry was posted on August 11, 2013 at 9:43 pm08 and is filed under Uncategorized. You can follow any responses to this entry through the RSS 2.0 feed. You can leave a response, or trackback from your own site.